Inside Secure DTCP Toolkit provides all the required features for a complete content protection solution with all content control and management capabilities. Besides the cryptographic functions and secure computation module, the software includes the implementation of the state machines as defined by the standard and supports the TCP/IP based-communication between a transmitter, a receiver and a repeater (bridge). Widely adopted in consumer electronic products from set top boxes and digital TVs to Blu-ray and DVD recorders, and in conjunction with a spectrum of cable, satellite, and media services, DTCP-IP is a mandatory requirement for DLNA devices that support protected streaming and applies to many Digital Rights Management (DRM) and content protection solutions. DTCP-IP combines the management of advanced cryptographic functions, authentication, digital signature algorithms, key storage and management, all in accordance with the standard. Inside Secure DTCP-IP solutions are ready-to-use. 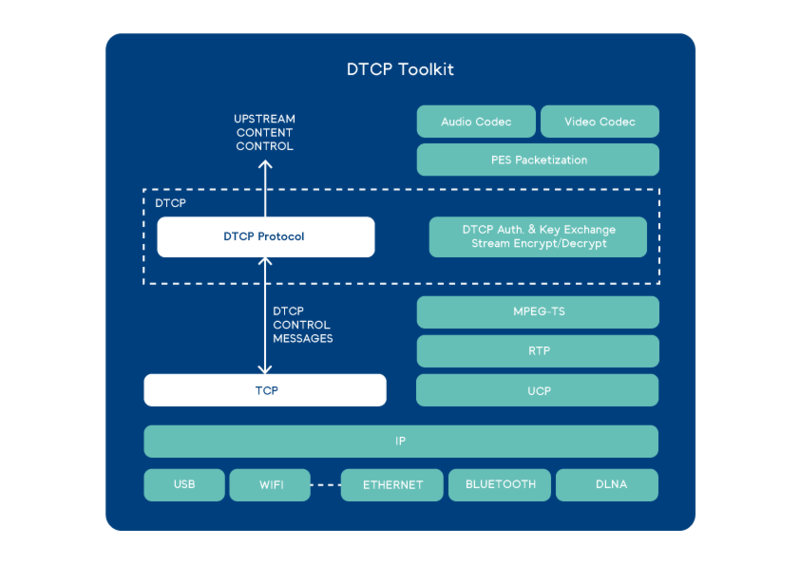 The Inside Secure DTCP Toolkit solution is optimized to reduce the power consumption and to also offer the ability to off-load data processing to the hardware, thus further reducing the power used by the DTCP-IP protocol. Inside Secure provides ready-to-use software solutions to implement DTCP-IP and guarantee the protection of the secret keys, the encryption of high-value contents, key exchange mechanisms, mutual authentication and repudiation of devices that have been compromised. Our DTCP-IP solutions support the four layers of copy protection: copy control information, device authentication and key exchange, content encryption and system renewability. The secure part of the content protection system can be implemented by a hardware-protected software using a Trusted Execution Environment (TEE). In addition, a highly secure and optimized hardware module (Root-of-Trust Engine) is available to provide the maximum security, an easy system integration, optimal performances and low power consumption for applications where no TEE is required or available. The Root-of-Trust Engine forms the hardware-based secure area where all the secure parameters and the cryptographic computations are managed during all the DTCP-IP protocol phases from authentication of the connected devices up to and including the generation of the key stream. 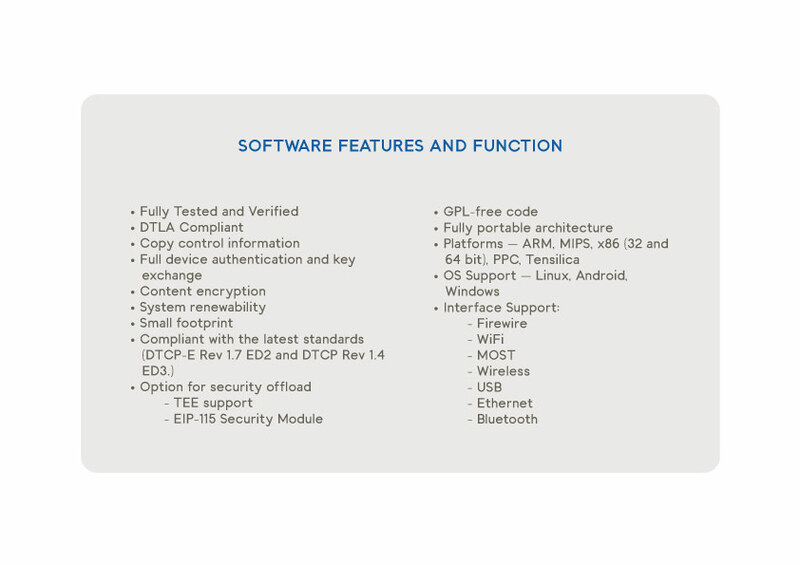 Inside Secure provides a software solution, easily integrated with a TEE, which implements all the functions of the DTCP-IP protocol. The DTCP Toolkit can be implemented simply with OS interfaces. Inside Secure also offers a hardware IP module that increases the performances and the security of the system. Both approaches significantly reduce the cost and complexity of bringing to market server and client DLNA-certified media devices.